What Was Your Most Memorable Expat New Year’s Eve? 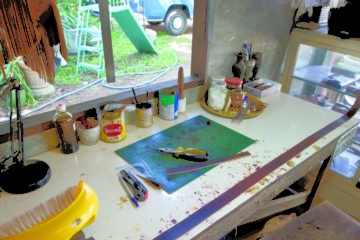 This is a guest post from Tan Your Mind, Outpost’s web series in Thailand. Click here to see more. Like Roman Catholic cathedrals in Europe, the antiquity of all ancient Buddhist structures is part of their allure—the knowledge that thousands of pilgrims linked via threads of mysticism and, akin to Yi Peng sky lantern wishes, likely praying for the same things have ventured here throughout the eras. So when I learned that the Chalermprakiat Temple was only about 12 years old, I had my doubts. I initially imagined an underwhelming structure like the small Protestant churches in the West where parishioners host bake sales and clothing drives. When we arrived, however, I discovered that it mirrored those I’d seen elsewhere in Asia, and if I didn’t know better I’d have assumed the same sense of timeless connection to the barefoot steps of those who’d trod before. I expected Chiang Rai’s Wat Rong Khun (also known as the White Temple), designed and constructed by local artist Chalermchai Kositpipat, to be similar. But I was astoundingly wrong. 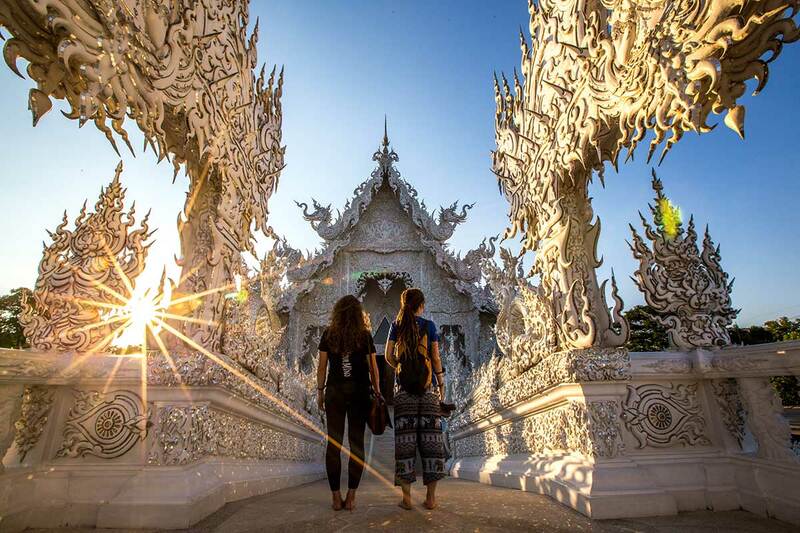 Wat Rong Khun is an ice-princess fairy tale dream. 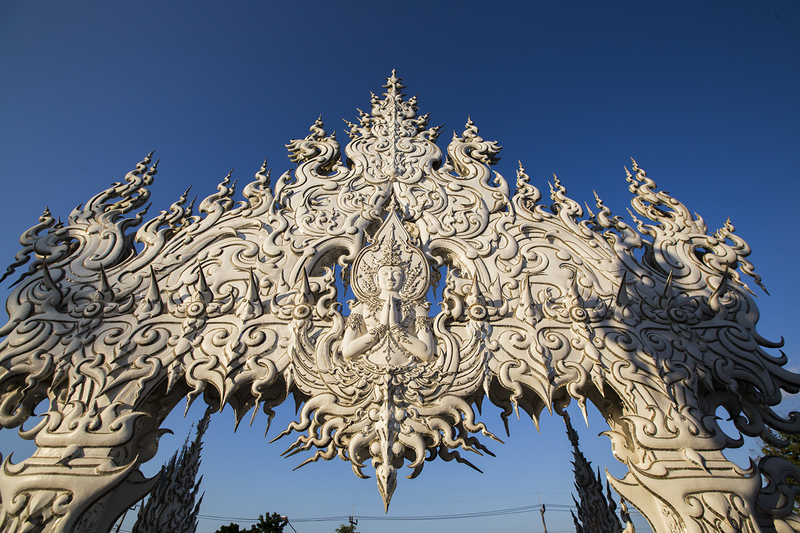 Dove-white, lacily ornate and accented with pieces of glass that sparkle in the sunlight like ladyboy cabaret dancers (more on that later), Wat Rong Khun resembles an ice palace in a fairy tale. And, like most fairy tales, it includes dark underpinnings: surrounding the temple is a lake of souls damned by their materialistic desires portrayed as hands desperately reaching and faces contorted in agony. The inside of Wat Rong Khun is, at first glance, like most temples with gold paint and a wax monk poised in deep contemplation. (The boys in our video crew bowed brow-to-floor in reverence before said monk and were thus crestfallen when I informed them he wasn’t real.) Yet a closer look reveals unusual murals depicting sci-fi imagery as well as references to terrorist attacks, nuclear warfare and The Matrix. 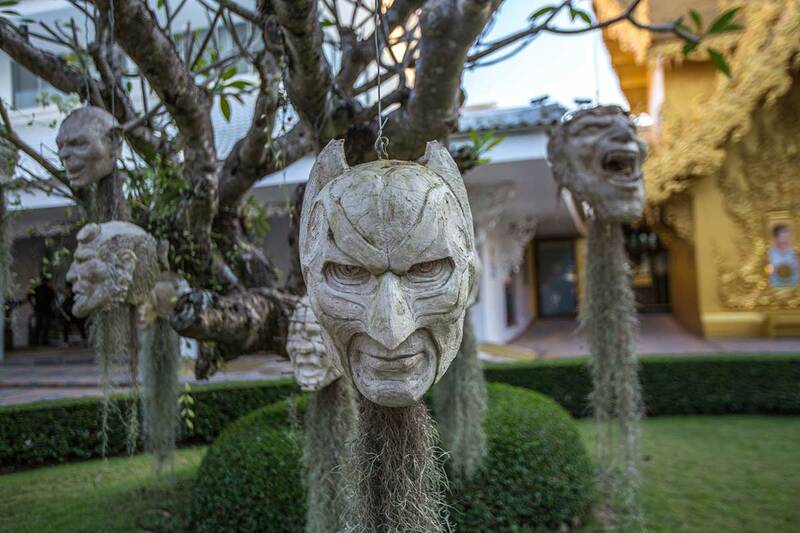 Pop culture adorns Wat Rong Khun in myriad little ways. It may seem like a weird choice of décor for a temple. But then again, science fiction is traditionally a medium for philosophic and social commentary, so what better place for it than in a religious structure where people turn in search of answers to the fundamental why’s and how’s of life? We even had the opportunity to meet the artist himself. Sitting wide-legged at a carved table surrounded by low-bowing architects, engineers and assistants, he reminded us of a mafia don commanding his henchmen. The man in the middle is not nearly as intimidating as his posse makes him look. Sweating through our Outpost T-shirts, we asked for permission to film amidst a nonsensical abundance of please’s, thank-you’s and ill-placed sawasdee-ka’s (which is an automatic and awkward resort of ours when at a loss for words). It was therefore with the ushering artist at our heels that we scampered off to explore this curious and bold house of worship. We’ve got the video to prove it—but for that, you’ll have to wait for our web series, coming soon. 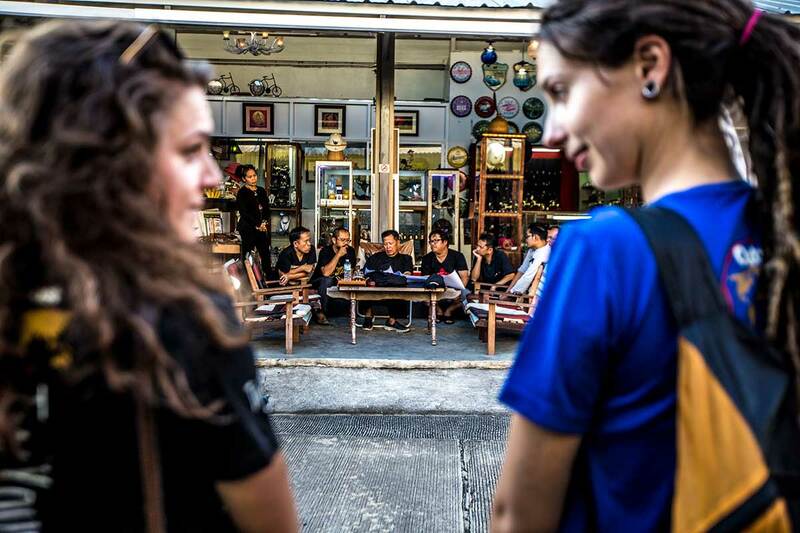 Check out more from the Tan Your Mind team in Thailand!